Sign up to the Perth Symphony newsletter so you never miss out again! Sign up here. 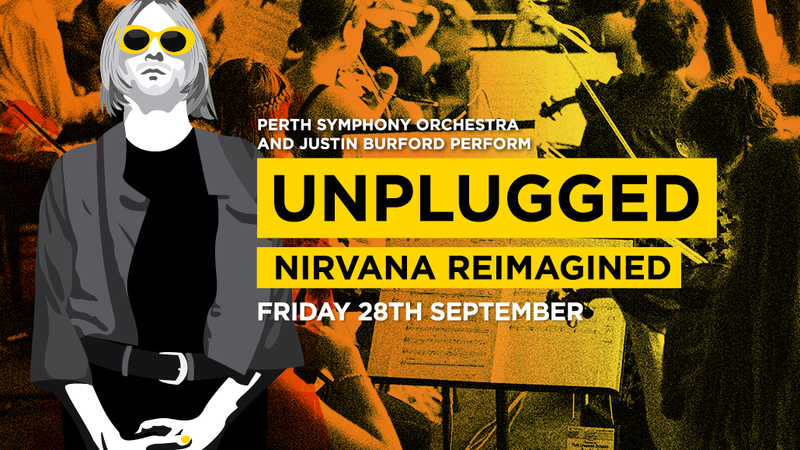 It was the sold out success story of 2017 when Perth Symphony Orchestra and Justin Burford presented UNPLUGGED: NIRVANA REIMAGINED at His Majesty’s Theatre, a unique concert event unlike anything seen before in WA (or the world) that has since led to international interest in the artists and charts written for the show. This isn’t just Nirvana with strings. Prepare to witness a fully-fledged orchestra in bloom, transformed for one night only into a raging rock beast. Already regarded as “the orchestra that breaks rules” for their radical reinterpretations of everything from Ministry of Sound to Beethoven to WA’s greatest ever songs at RTRFM and the WA Museum’s elaborate event A Moment in Time, Unplugged: Nirvana Reimagined will take orchestral sounds to some heavy, heavy places. Using Nirvana’s legendary MTV Unplugged in New York as inspiration, which took place just five-months before Kurt’s untimely death in 1994, PSO will take songs from the concert and from throughout Nirvana’s discography and blow them up. Imagine About a Girl and Where Did You Sleep Last Night backed by a wall of sound big enough to match the angst in the songs. Picture Smells Like Teen Spirit and Lithium pushing the year punk broke, 1991, into the stratosphere. Unplugged: Nirvana Reimagined will not only take you back there, it will remind you of music, culture and a generation changing forever. Perth Symphony Orchestra commissioned the talents of award-winning arranger Ash Gibson Grieg to write the charts, no mean feat given he was often turning two chords for guitar into a full orchestra score. “Creating the orchestral arrangements for Nirvana Reimagined is primarily about one thing: finding the soul of each piece and using that as the inspiration,” he says. Joining PSO is award-winning songwriter and the veteran of sold out Nirvana reinterpretations from Melbourne to Perth, Justin Burford. With his legendary band End of Fashion well and truly back, one of the greatest voices WA has ever produced will lead the concert alongside conductor Jessica Gethin, and no one nails Kurt quite like him. Now Burford and PSO are reuniting for an encore performance of their most ambitious show ever. It is a dream event for the artists and Nirvana fans alike, and it will once again take place at His Majesty’s Theatre – a venue big enough to capture the hopes and dreams of a generation. Tickets: From $79 +bf – on sale 23rd May.